This car was part of a three car set including car numbers 90380, 90379, and 90378. This set was one of three multi-car sets offered by Industrial Rail. Called "Gift Packs," they included: IDM 8050 Tuscan Log Cars (3-pack), IDM 6050 Hot Sauce Tank Cars (2-pack), IDM 4050 Frisco Hoppers (3-pack). SL-SF 90379 was part of a group of hoppers numbered 90000-90499. These 33' twin-bay hoppers were built by Pullman-Standard in 1948 at a cost of $3,741 each. 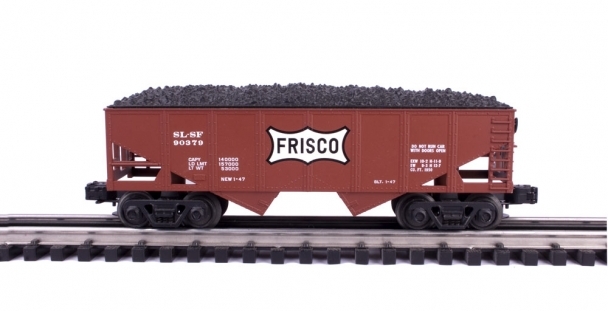 This series was unique to the Frisco because it was the only series of hoppers to have notched angular heap shields (not represented on the Industrial Rail model). 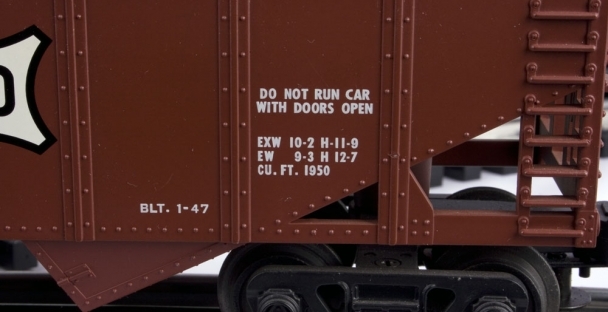 "Over fourty years of modeling and hobby experience is behind the Industrial Rail name. Whether it is attntion to detail in the hand painted bodies, of the finished undercarriage, Industrial Rail puts the quality and detail in its O27 scale products which train modelers appreciate as well as expets. 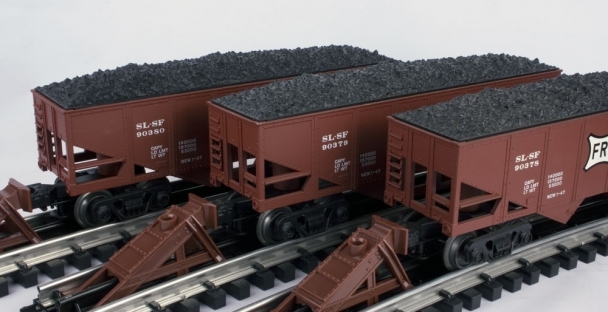 Not toy like, but products with features and finishing touches such as needle point axles, metal wheels and trucks and metal couplers, which true train enthusiasts demand. Industrial Rail is created for those who appreciate quality and realism at an affordable price. Whether you are adding to your first train set or you are an enthusiast building a masterpiece, join the thousands who have invested in the features and quality that is Industrial Rail."